With the honour of carrying the Olympic flame in 2004 behind her, Olympias has returned to her permanent display site as part of the Hellenic Navy Museum, based around the heavy cruiser Averoff, at Neon Faliron near the Piraeus. She now has a new shelter (see photos), which should protect her from the sun and the rain and keep her looking good with only routine maintenance for the foreseeable future. All this means, of course, that Olympias herself is unlikely to go to sea again, except perhaps for short ceremonial occasions like the Olympics (she was, of course, named after the Games, as part of Athens' earlier bid for them for 1996). Her hull, although now looking splendid for visitors, would certainly be unacceptably weakened by any prolonged sea-trials. The best bet for any future sea-trials would therefore be to build a second ship (to John Coates' revised design) and Doug Lindsay, who was one of the Sailing Masters in Olympias, continues to pursue possibilities for funding such a ship. The Trust's Council is currently considering how the award of the Olympic Games to London in 2012 might be used to encourage donors. Meanwhile, the Trust is being kept very busy by continuing to publish and make use of the results of all those sea-trials between 1987 and 1994. The editing of the reports of the 1992 and 1994 trials and the papers of the 1998 conference held in Henley and Oxford is nearing completion, and the volume containing these should appear in print in 2007. All aspects of the original project will then have been published in detail for the benefit of future researchers. Meanwhile, the papers relating the project accumulated by the late John Morrison, together with Jon Coates' construction note-books and plans are currently being catalogued and archived for posterity in a project which is reported upon in detail elsewhere in this Newsletter by John Quenby, a former Chairman of the Trust,. In addition, a core collection of plans and photographs of Olympias have now been scanned onto disc. The Leverhulme-funded Ship Sheds project, based at Royal Holloway, University of London, is now in the last of its three years and the manuscript is due for delivery to the publishers in April, 2007. When completed, not only will this greatly expand our understanding of these buildings, based in part on recent excavations and surveys at Giardini-Naxos in Sicily, Zea harbour in the Piraeus, Cape Sounion in Attica, and elsewhere, but it should enable us to check and reconsider some aspects of the Olympias design which was based in part on the dimensions of the Zea sheds as then understood. Looking to the future, a bid is currently being put together by the Chairman for another large research grant, this time to the Arts and Humanities Research Council, to make use of manoeuvring data collected during the 1988 trials of Olympias. These Trials were unusual in that Olympias' every move was recorded by a laser-based instrument known as a geodimeter, accurate to within a few centimetres and thus significantly more precise even than a modern Global Positioning System. The proposal will be to develop a computer manoeuvring programme using these data at the Department of Mechanical Engineering at University College, London, on the basis of an existing ship-programme supplied through the good offices of Council member Doug Pattison. The programme will then be used to simulate battle manoeuvres between individual ships and even between whole squadrons and fleets. These simulations will be analysed with the help of historians from the War Studies department at King's College, London who specialise in conflict simulation, and with input from Andrew Taylor, Pulling Master in Olympias in 1994 and an experienced war-gamer, who first suggested the whole project. The intention will be to produce a major study of the practice of naval warfare in antiquity, and if possible a 3-D version of the computer simulation for academic and educational purposes (known in the business as a 'serious' computer game). It is hoped that the results of the original Olympias project will continue to stimulate and inform this and similar spin-off projects for many years to come. I would like to end, however, firstly by offering warm congratulations to our Treasurer, Andrew Ruddle, on the award of a doctorate by the University of Manchester for his dissertation 'A Socio-Cultural Study of the Development of Attitudes to the Use of Performance-Enhancing Drugs in Sport'. And secondly, I wish to record the Trust's heartfelt gratitude to John Allan, who has stepped down as Secretary after more than a decade of service, and to welcome his successor Andrew Morrison. The Trust owes John an enormous debt of gratitude for years of taking Minutes, guiding the Chairman through the minefields of committee procedure, and in general keeping the Council and the Trust running smoothly. We are delighted that it will continue to benefit from his wisdom and experience as a member of Council. Olympias has returned to her permanent display site as part of the Hellenic Navy Museum, based around the heavy cruiser Averoff, at Neon Faliron near the Piraeus. Trust members and friends who are visiting Athens will find it easier than ever to go and see her, by taking the Metro down towards the Piraeus, getting off at the penultimate stop (Neo Faliro), crossing the road to take the tram which runs eastward down the coast, and getting off at Trokadero, from where it is a very short walk to the Averoff. 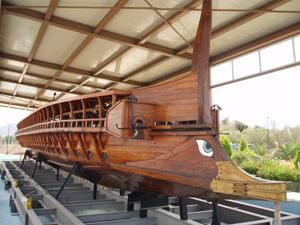 There are plenty of really interesting historical vessels to look at and walk round (not least the magnificent Averoff herself), and you can get a good view of Olympias across the fence even if the Museum is closed. For opening hours, see the Museum's website (www.bsaverof.com). Andrew Ruddle is keen to clear the last stocks of Trust merchandise, and can offer eight different mug designs in a mix of bone and earthenware styles for sale at not much over cost. Stocks of particular designs vary, so the offer is strictly first-come-first-served, and there is a discount for orders of more than ten. There are also tea-towels available, which double as a smart wall-hanging - four designs, also priced to clear. Please e-mail Andrew Ruddle to enquire what is still available . A visitor to the office of Trust Chairman Boris Rankov at the Royal Holloway site of London University in Egham might feel prompted to remark on the rather cluttered state of affairs there. It goes without saying that any classics professor's domain is going to be filled with all the books, papers and paraphernalia that go with the job but the current situation is rather exceptional. For there in a large assortment of boxes and sundry containers currently resides the Trireme Trust Archive! These documents, files, journals academic papers, work books, plans, drawings and photographs are in fact the accumulation of the wealth of material generated by the Trireme project, dating from its inception (arguably in 1975 with the now famous exchanges of letters in The Times) until the present day. The only problem is that all this material is currently an unedited, unsorted, uncategorized mess!! At its October 27th 2005 meeting, hosted at her Oxfordshire home by Annis Garfield, the TT Council decided that the archive should be brought together into a single location and formally catalogued. This should be done in the most effective way designed to provide ready access to future generations of researchers and students of oared warships in general and triremes in particular. 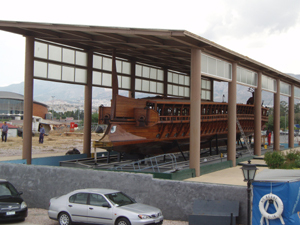 Thus was born the Trireme Trust Archive Project. It is hoped that it may be possible to house the archive at the River and Rowing Museum at Henley, but this clearly presupposes that the archive materials will be classified, catalogued and physically assembled in an orderly and formal manner. As I was in attendance for the AGM that day and I am already involved with a museum archive, it was suggested that I would coordinate the search for appropriate software and propose a catalogue structure. As a foundation to production of a formal archive catalogue, it was agreed that if possible the key information and indices should be held on a computer database, as upon review it was evident that the volume of documents involved (some thousands) could not really be managed efficiently with a card index system. Thus recognising the trust's need to maintain vigilance over its budget, a search was initiated for the existence of any reasonably priced proprietary software. Fortunately we quickly alighted upon a survey conducted by The Museum Documentation Association (MDA) which pointed us towards the Modes Users Association (MUA) software packages. MUA, based in Derby turned out to be the most prolific supplier of archive and catalogue software in the UK. Its two main products are MODES and Catalist being in current use by literally hundreds of museums and private archives across the country. Discussions with MUA proceeded rapidly and an analysis of the features and functionality of the two products led to a recommendation to the TT Council meeting held at Egham on 18th April this year for the Trust to purchase the Catalist package and associated user training to enable a start to be made on cataloguing the archive at the earliest opportunity. In 1988 Roz Savage rowed as a Thalamian on the Greek Trireme. That was the first time she rowed on open seas ­ in a 35 metre boat with 170 other rowers. The second time she rowed on open seas she was in a 7 metre boat, alone. 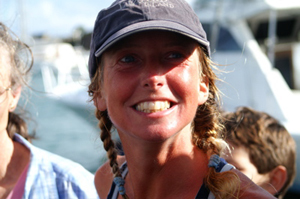 She set out from the Canaries to row 3000 miles across the Atlantic Ocean as the only solo female competitor in the Atlantic Rowing Race 2005. Storms and high seas gradually stripped down the boat to bare essentials, with the stove, music system and navigation instruments failing. 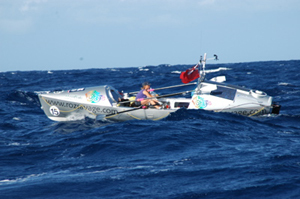 All four of her oars broke before the halfway point ­ two while rowing and two when her boat capsized in 20 foot waves. Determined not to surrender her unsupported status by calling for replacements, she patched them up and battled on even when her unwieldy oars caused grinding shoulder pain. Her satellite phone failed on 17th February presenting Roz with her toughest psychological challenge yet ­ total isolation - for the remaining four weeks of the row. At last she arrived to a rapturous welcome in Antigua on 13th March 2006, 103 days after setting out from the Canaries. She was the last boat to finish, but still fared better than the 6 crews (out of a total 26 crews that started) that sank or capsized and had to be rescued. During her epic voyage Roz acquired a loyal following around the globe as internet users logged on to her inspiring, insightful and entertaining dispatches. They will now be eagerly awaiting her next adventure... for it would seem that 103 days alone on the Atlantic weren't enough. The 38-year-old former management consultant has announced that she intends to row the Pacific in a 3-stage challenge launching from San Francisco in Summer 2007. Click here to see videos of the Atlantic row and track Roz's Pacific preparations.